at McTears or on eBay. 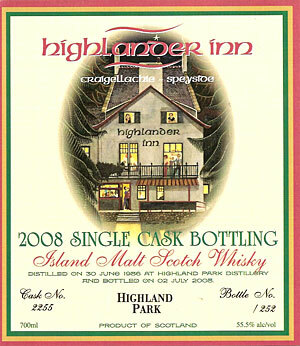 This is the eighth of our annual "Single Cask Bottlings" and another first, this time from Highland Park Distillery. Cask Number 2255 was distilled at Highland Park in Orkney on 30th June 1986 and held in their bonded warehouses until February 2008 when it was specifically selected at a nosing and tasting at Duncan Taylor & Company's warehouses in Huntly. When bottled on 2nd July 2008 ~ just 2 days after it's 22nd birthday ~ at its natural cask strength of 55.5% alc/vol, it yielded only 252 bottles (700ml). The picture on the front label and certificate of ownership is from a painting by Maggie Riegler, a well known landscape artist with her own inimitable style, of the Greenhall Gallery here in Craigellachie, especially commissioned by us for this bottling. This is the 8th consecutive year that Maggie has created the paintings for all our Annual Single Cask Bottlings since the first bottling in 2001! 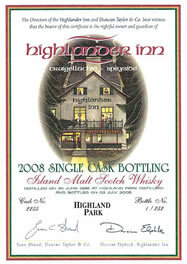 This year's picture is of an evening scene at the Highlander Inn, featuring recognisable customers and staff. Alas, after 7 consecutive years, our good friend Michael Jackson wrote his last tasting notes for our 2007 Single Cask Bottling, before St. Peter 'called him through the pearly gates' in August 2007. 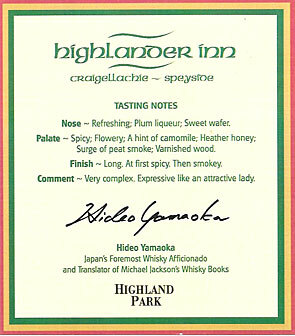 We are however delighted that this year's tasting notes that appear on the back of each bottle, have been written by Hideo Yamaoka, Japan's foremost Malt Scotch Whisky "otaku", also a good friend of Michael's, and the translator of his books on whisky into Japanese. It is still available by the nip (25ml) in our bar at £6.90.